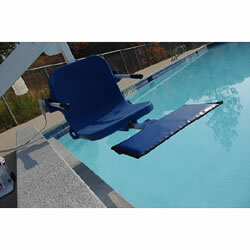 Pull-out leg rest attaches to all Aqua Creek Pool Lifts except EZ series. Replace your standard footrest with this adjustable pull-out leg rest. This is a great option for when lift is used in spas or when a little extra leg support is needed. This pullout leg rest provides additional leg support for users of the Pro Pool™, Revolution™, and all Aqua Creek Spa™ Lifts.